The offseason training camps for winter from December through to February will take place in Los Cristianos, Tenerife. Our camps are fun, friendly, social and influential and aimed at the already committed beach volleyball player who has the stamina to last five intensive days of coaching and playing. Each camp has typically 24 people run over 3 courts with 8 athletes on each court and one coach per court. For 2019-2020 we have three weeks for small groups only. If you would like a week just with Denise Austin and prefer to work as a unit, then this is for you. The camps runs for five days with coaching from 9:00-1:00 daily, followed by ocean recovery sessions. We will record various parts of your training and will store to your own online library. There is open game play every day in the late afternoon. 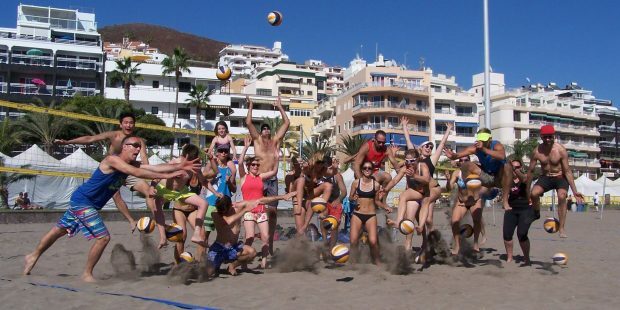 We also have the opportunity to organise tournaments with other beach volleyball coaches and local residents while you are there. The cost for the five days’ coaching is £240 per person if you pay by BACS + 4% if by PayPal/credit card. Individual registration available although booking in small groups helps with accommodation, travel and fun! Flights and accommodation are your own responsibility as well as insurance. The area to stay in is Los Cristianos and as close to the harbour as possible. Insurance should be done at your own expense but we recommend insure 4 sport who covers our coaches and company insurance. The link is for individual player insurance for volleyball for a year. UK residents, don’t forget to click worldwide. As an active person we highly recommend that you take out personal insurance, due to potential cancellations as well as accidents during your adventure. We are not able to refund up to eight weeks before the start date of your camp. Any cost rises this year are going straight to the coaches pay and development. We appreciate your continued support of their choice to sustain a beach volleyball coach life.